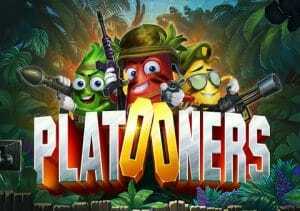 Join the Mininionesque creatures known as the Bloopers who are on a film set shooting a Vietnam War film in Platooners. Created by ELK Studios, it’s a 5 reel, 187 ways to win video slot. Highlights include the Action Spins which award extra wilds, 5 of a kind wins and reels filled with matching symbols. There’s also a multi-stage battle bonus. Stakes range from between 20p and £100 per spin. ELK Studios are one of the better developers when it comes to design and Platooners maintains their usual high visual standards. The action takes place against a tropical jungle backdrop with the reels flanked by lightning and movie cameras. On the reels you’ll see the usual lower value playing cards plus symbols more in keeping with the military theme. They include dog tags, machetes and binoculars. It’s all very well done. Green Rockets Platooner feature – he fires grenades at reels 1 and 3. All the symbols on these reels transform into the same matching symbol and a new payout is made. Red Grenades Platooner feature – grenades are blasted onto reels 3, 4 and 5. Any symbol where a grenade lands turns into a wild. A new payout is made with the extra wilds in position. Yellow Bullets Platooner feature – the yellow Blooper fires off a volley of bullets and in the process delivers at least one but possible more 5 of a kind combinations. Land 3 or more bonus scatters on the same spin to trigger the Platooners vs Snakes of Fortune – the 3 Platooners do battle with the golden snakes in this battle bonus where you begin with 15 free spins. The goal here is to defeat the snake and progress to the next level where the prizes on offer increase. 3, 4 or 5 bonus scatters will see 1, 2 or 3 Platooners attack the snake on each free spin. Attacking the snake with 2 or 3 Platooners doubles or trebles the strength of the attack to boost your chances. If you do see off a golden snake and move to the next level, the Platooners’ weapons are upgraded and you’ll receive more ammo as well as additional free spins. There are 4 snakes to defeat in total. This is quite a volatile video slot as the variance is in the medium to high range. You can expect to land the Action Spins features fairly regularly which keeps things ticking over in the gaps between triggering the feature. There is over 2,500 your bet to be won on every spin which is good. As usual for an ELK Studios title, we have few complaints about the design. The game has been optimised for mobile devices making it a great pick if you’re on the go. The slightly out there theme won’t be for everyone but he classy design and decent extras make Platooners worth considering though. I think it’s another great game from ELK Studios – as you’d expect. If you’re not familiar with their work, I suggest you try Sam on the Beach and Wild Toro.